You are currently browsing the category archive for the ‘Bits & Pieces’ category. 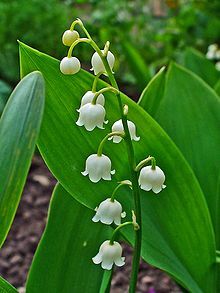 It is time to welcome Spring with the ancient Irish Festival of Imbolc! Normally this would be a laughable thing to imagine for a person in the Chicago area in February, who would more often than not, be snug indoors peering out at a snow-covered world and listening to the icy howl of winter wind. However this year in Chicago, except for a few normal winter-like days, January and this first day of February have felt more like Spring than Winter! In fact, yesterday I actually saw a child dressed in a t-shirt and shorts working as a crossing guard at my son’s school – though I couldn’t keep my self from mumbling, “Doesn’t that boy have a mother?” So this year anyway, welcoming Spring does not require a great stretch of the imagination. Imbolc falls about halfway between the Winter Solstice and the Spring Equinox and was a pagan Irish festival that marked the beginning of Spring. Today Imbolc is more commonly celebrated as Lá Fhéile Bríde, St. Brigid’s Day. This is one example of the early Christian tactic in Ireland of superimposing itself over the long-standing pagan rites and celebrations, which worked so well, to convert Ireland to Christianity while avoiding the bloodshed experienced in so many other lands. By creating the Feast of St. Brigid on February 1st, the pagan goddess Brigid, was somewhat seamlessly replaced with the Christian, St. Brigid of Kildare, of whom I’ve written a bit more about in an earlier post titled St. Brigid’s Day. So, today I wish you a happy Imbolc and a happy St. Brigid’s Day from lovely, mild Chicago and leave you with a poem that is not only attributed to St. Brigid herself, but is a great example of why she is so loved and admired to this day! Leaving West Clare and returning to the suburbs of Chicago is like waking up from a dream that fades from consciousness as the day goes on. My life here is so removed from my life there that writing about Ireland and our little cottage in the bog has become difficult. Since my last post and our return to Elmhurst our days have been busy and filled with both routine and pleasure. After much preparation and adjustment, Eoin is now off and running in 4th grade and has moved his attention from watersports and horse riding to lots of homework, intramurals and band practice. In September I managed a trip to L.A. to visit my daughter Kate and then enjoyed a surprise return visit from her a week later! 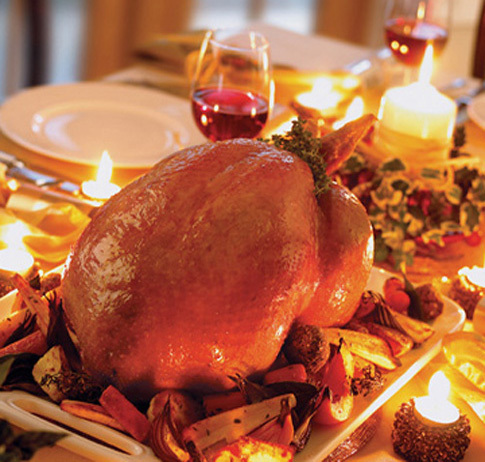 Thanksgiving was marvelous, in spite of a missing daughter, because my oldest son Anton was with us and we feasted as though there were a dozen people at the table! Now I am preparing for Christmas – slowly but surely – and looking forward to my daughter being home for two whole weeks and to a full house for the holidays! Kevin, Kate’s boyfriend, will be joining us and Anton, I’m hoping, has been adequately pressured into staying the night and waking up with us on Christmas morning. Life is good, but at the moment it is far removed from Ireland and the theme of this blog. However, my computer is stuffed full of photographs to jog my memory and I still have a few more things to say about the sights and experiences we were lucky enough to enjoy during the coldest Irish summer in nearly 50 years! So, my plan is to get back to writing as soon as possible, which will probably be, after the holidays. But until then, although I’ve been satisfied for the past few months to see Vincent van Gogh’s lovely Starry Night at the top of the page I think it’s time to push it down a bit, replacing van Gogh with Sinéad and this beautiful rendition of Danny Boy that has me thinking of Ireland again! Sccrrrrratttchchch!!! Ch-ch-ch-ch-ch-scratttchhhh… ssccccrrraaaaaape!! This is a weak and mild imitation of the sound we woke up to this morning. Declan was sure it was outside the window – I swear it was near or under my side of the bed! This went on between stretches of silence for about 40 minutes. Having seen no evidence of the presence of any rodent type creatures in the house all summer, my hope is that Declan is right and we just had a bit of bird activity in the stones outside. Perhaps the pheasant, which paid our house guests a visit each evening in May but has only darted past our car a few times across our bumpy road, has returned to prepare a winter home nearby. Yes, that’s the ticket. It had to be that beautiful pheasant! Just as every cloud has its silver lining, several hours earlier Eoin and I stood in the darkness of the wee hours outside our country cottage gazing up at a clear, night sky that sparkled with billions of stars of every size… glowing, twinkling and even shooting! Eoin had never seen such a sight in his entire life and I only have vague memories of viewing it as a child. 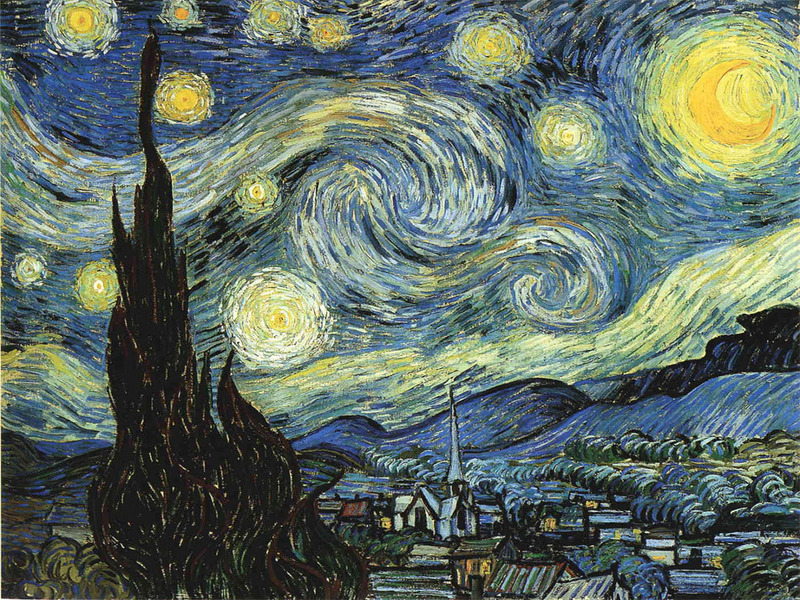 I wouldn’t trade the starry night for a quieter morning, no matter what was making that horrifying sound! Flags lined both sides of the main street through Moneygall. 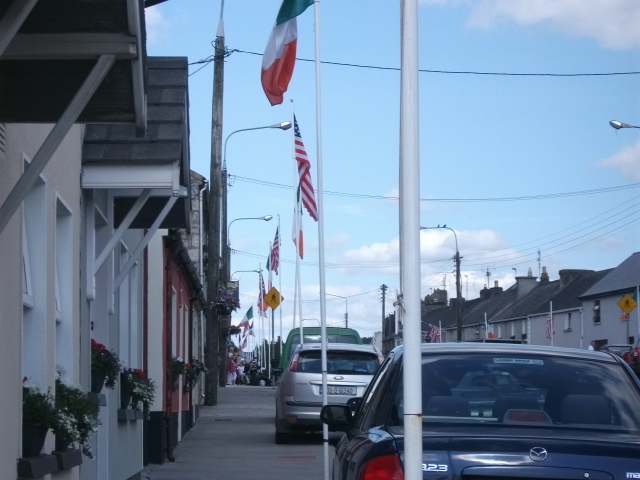 The Fourth of July is just another day in Kilkee, but on Sunday, July 3rd, the “4th” was celebrated with a U.S. 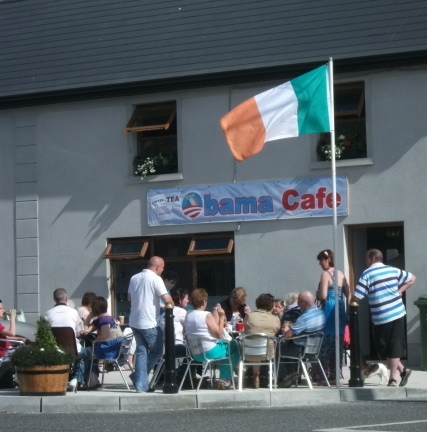 Independence Day Festival in President Obama’s ancestral Irish village of Moneygall, a town with residents still delighted over the President’s May 23rd visit. The band was playing mostly American Country Music on a hot, sunny Chicago-like summer's day! 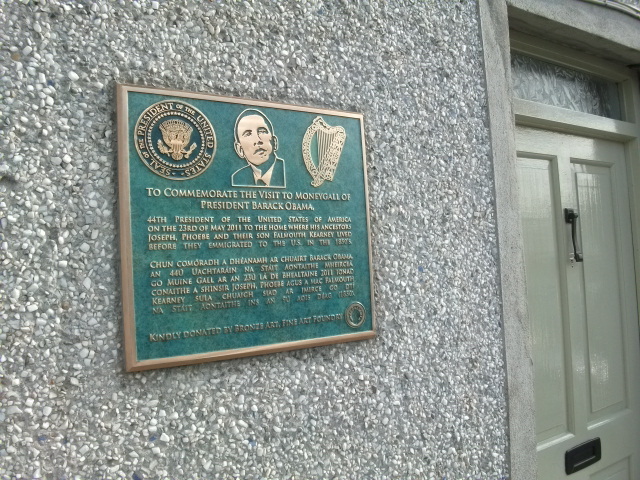 As we were traveling along the M7 motorway, returning home from Dublin on Sunday afternoon, I decided to turn off at the Moneygall exit in order to have a look at the town from which President Obama’s maternal great-great-great-grandfather, Fulmuth Kearney emigrated to the United States in 1850. Although I expected to see some signs that the president had been there, I was not expecting a crowded town with American and Irish flags displayed along the main street and a festival taking place. Although Eoin and I did not seek President Obama’s Irish 8th cousin, Henry Healy, we did stay long enough to enjoy the band onstage playing mostly American Country music, have tea and delicious home-made apple pie in the Obama Cafe, buy a couple Is Féadir Linn/Yes We Can t-shirts and read the plaque on the President’s ancestral home, having just missed the tour hours. 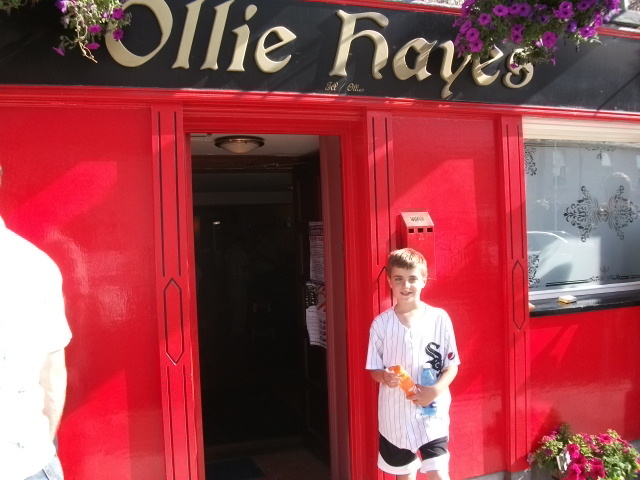 We even had a look inside the now famous Ollie Hayes Pub, where the President and First Lady enjoyed a pint during their visit. 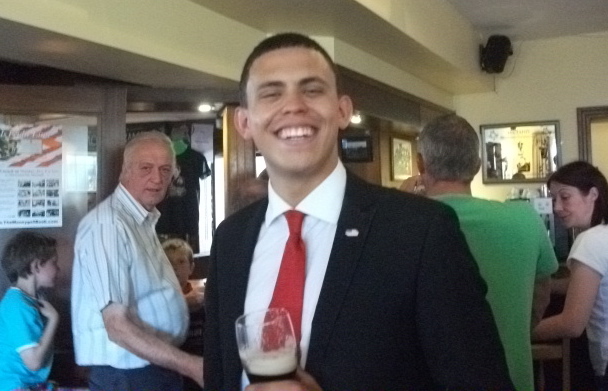 Inside we found an Obama impersonator schmoozing with the locals! 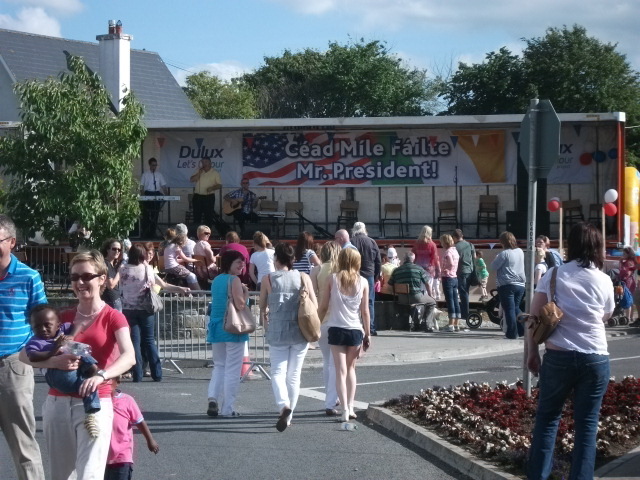 It may seem a bit over the top to some, but it was all in fun and the President’s visit appears to have given a needed economic boost to this quaint little town nestled within the fertile, green landscape of County Offaly at the border of Tipperary! Although the theme of the bog blog is mainly focused upon Ireland and my cottage related experiences there, today with my daughter’s permission, I am posting the link to an Independent Film Short that recently premiered in L.A..
… has absolutely nothing to do with Ireland, but I will justify posting it here by pointing out the combination of the very Irish name of its filmmaker, Eddie O’Keefe, and the fact that my daughter, Kate, is the female lead and narrator …as if a mother needs a reason to post her daughter’s movie on her blog! 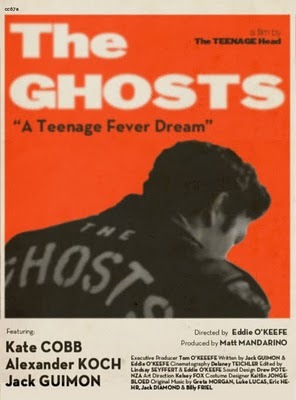 *UPDATE* To make the movie download quicker and thus, less jumpy, after going to the link place your curser over the lower right hand portion of the video and “HD“ should appear. If you click on that “HD“ the high definition will shut off and the video should play better. Click “HD” and “HD is off” should appear on the screen. **UPDATE** A password may now be requested in order to watch the film- shhhhh – it’s “cicadas”. As we hunker down in Chicago awaiting what we’ve been warned will be a blizzard bringing anywhere from 1 and 2 feet of snow by tomorrow afternoon, let’s remember it’s the first day of Spring – according to the Celtic Calendar anyway! Lá Fhéile Bríde, St. Brigid’s Day, falls on the 1st of February and is the Christian replacement for the pagan festival of Imbolc, which honored the goddess Brigid, and celebrated the official beginning of the growing and lambing season. 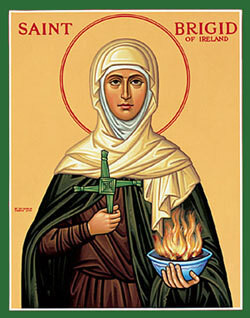 St. Brigid, a contemporary of St. Patrick and often called “Mary of the Gaels” is still a popular saint in Ireland. There was a time when people believed that she walked the earth on her feast day, in the company of her white, red-eared cow, bestowing blessings upon people and livestock. The tradition was for families to welcome her by leaving an oaten cake and some butter on the outside window sill – along with some corn for her cow. People would also tie ribbons, bits of cloth or handkerchiefs on tree limbs or clothes lines, to be blessed by St. Brigid as she passed their way. This blessed remnant of cloth, called “St. Brigid’s Mantle”, was once thought to have special healing powers. I doubt that many people these days follow this particular tradition, except perhaps in the spirit of celebration and acknowledgment of Ireland’s historic past. 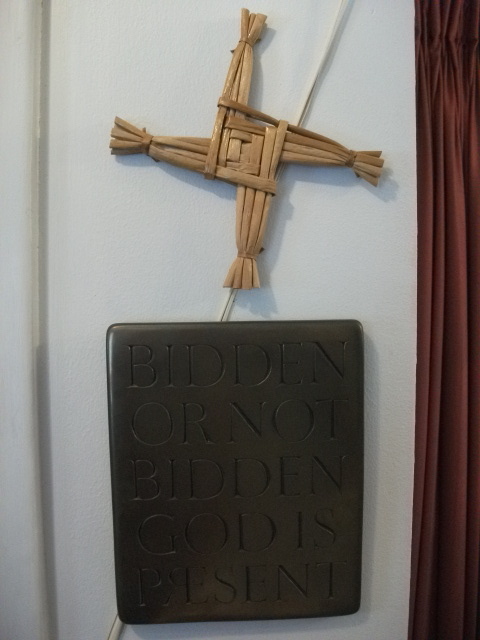 However, I do believe young school children still practice the tradition of weaving St. Brigid’s Crosses from rushes to bring home for their parents to hang upon the wall in place of the cross they made the year before. Another practice that may still be followed today by some in Ireland, as well as a few Irish-Americans, would be the preparation of certain dishes traditionally eaten on St. Brigid’s Feast Day. These would be the afore-mentioned Oaten Cakes, as well as Boxty and, my choice for the day, Colcannon. Yes, I am going to try my hand at this traditional Irish dish today, as I watch the snow quietly piling up around my Midwestern Illinois home. There would be no point in attempting to create a St. Brigid’s Cross from rushes, because even if I knew what a rush looked like, it would probably be buried beneath several inches of snow in this place so far from St. Brigid’s country or any sign of Spring! Simmer kale or cabbage in 2 cups water and oil for 10 minutes, then drain, and chop fine. Boil potatoes and water, simmer until tender. Simmer the leeks in milk for ten minutes, until tender. Drain and puree the potatoes. Add leeks and their milk and the cooked kale, stir together. Stir in mace, salt and pepper. Mound on a plate and pour on the melted butter. Garnish with parsley. – Recipe courtesy fisheaters.com, where you will also find recipes for Boxty and Oaten Cakes. My store-bought St. Brigid's Cross. Not a bad first year for the Bog Blog! Thank you to all my visitors in 2010, here’s to 2011 being just as much fun! Happy New Year, beannacht Dé leat! In 2010, there were 79 new posts, not bad for the first year! There were 221 pictures uploaded, taking up a total of 26mb. That’s about 4 pictures per week. The busiest day of the year was January 9th with 176 views. The most popular post that day was A magic cup of tea. The top referring sites in 2010 were facebook.com, lifeonthecutoff.wordpress.com, mail.yahoo.com, en.wordpress.com, and ballylara.wordpress.com. 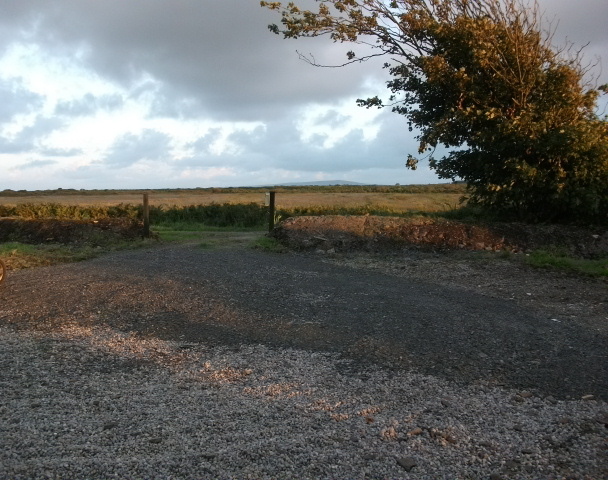 Some visitors came searching, mostly for daffodils, ennis ireland, blogging from the bog, magpies, and pancakes. While I’m here in the States being thankful for my many blessings this Thanksgiving, my husband will be on his way back “home” to spend a week in Ireland. Thanksgiving dinner at our house will be a smaller affair this year. My daughter is having her first Thanksgiving away from home, seated at a table I’ve never seen, in her L.A. apartment. That leaves just me and my two sons – and my husband – if we manage to have our feast on the table before the taxi comes to bring him to O’Hare Airport for his journey across the pond! Declan is happy to be going to Ireland, or perhaps, just to be enjoying a few days off work! Although it would be great to be going along, I can’t begrudge him this short trip on his own after Eoin and I were able to enjoy so many weeks in Kilkee last summer. The main reason for this visit is to batten down the hatches at Teach deBúrca and to see to it that the fuel tank is filled with sufficient oil to keep our West Clare cottage snug enough throughout the winter months to keep dampness out and the water pipes from freezing. After last year’s unusually cold weather we are even more determined to make sure the cottage stays warm and dry. Also while there, Declan is looking forward to inspecting our two outbuildings, which he expects to be standing proudly beneath newly installed roof cladding. Like the drainage ditches we put around the perimeter of the property last summer, the roofs are a necessity if we want to keep these rustic old relics intact. When Declan arrives at Teach deBúrca, it will be his first time crossing the threshold through our lovely, new, red half-door, which was not installed until after his departure last summer! Now that I’m thinking of it, perhaps I should supply him with written instructions for mastering the art of locking and unlocking the door. Also upon arrival he will, hopefully, be able to give me the good news that our Belfast sink is still sitting where I left it in August, despite the warnings I was given against leaving such a coveted item on display. … which brings me back to Thanksgiving dinner and the fact that it is already the end of November and I have taken such a long break from writing in this blog! I can’t explain my absence except to say that I’ve been pulled in many directions since returning to the suburbs of Chicago. The lazy days of a summer spent in Kilkee seem so far away… walks along spectacular cliffs, drives through the foggy mists of Loop Head, braying donkeys in the night, holy wells and abbey ruins, waves crashing against the rocks and upon the sandy shoreline, the daily navigation of potholes dotting the long, narrow gravel road that leads to our cottage, bright orange starfish in the tide pools… such a different world from life in the suburbs. I suppose it has taken me awhile to readjust and to begin to recapture the ability to exist in the two worlds at the same time. On our way to Christ Hospital the day Kate was born, a rainbow appeared in the sky before us and made an arc that seemed to end right at the hospital. When Kate was little I used to tell her about the rainbow, how it was visible during the entire journey to the hospital and that I believed she must have slid down the rainbow from heaven to come to me! What she probably doesn’t know is just how much I actually believed it might be true… and that the longer I know her, the more I believe it! 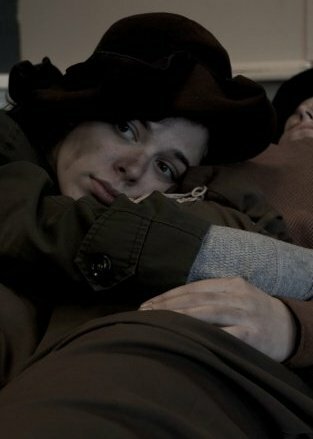 My-daughter-the-actress... doing what comes naturally, as Vladimir in "Waiting for Godot"
Happy birthday Katherine! You’ve grown from my sweet and sparkly baby girl to a lovely and vivacious young woman of 23… and though I couldn’t be there with you this time around, I’m so happy your brother could make the trip to L.A.! Have a great day and a magical year! Actually, I’ll be back in mid August, but being away for the summer reminded me of that great song, “See You in September”! We’re flying to Ireland today, and still, clothes are in piles on the living room sofa and not yet in suitcases! 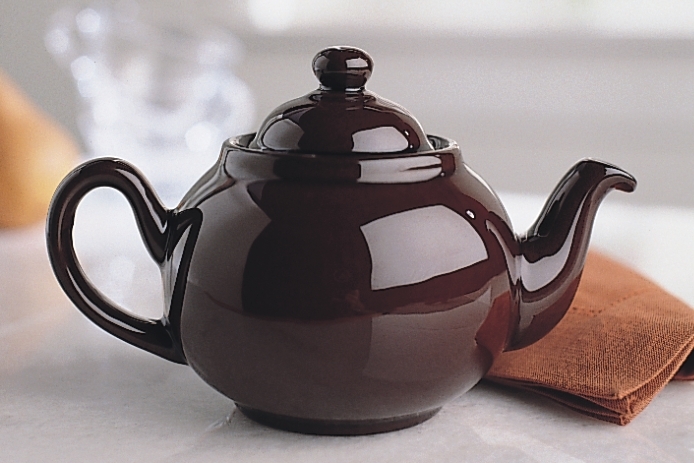 But it will all get finished and we’ll soon be on our way to meet up with The Traveling Butter Dish (see February 18th post), which is waiting for us in Naas, County Kildare, with its companions, the Nicholas Mosse pitcher and sugar bowl and their British friend, the Brown Betty teapot! Unable to fit these items safely into our luggage on the last trip, I finally sent them in the post to the home of a friend who was nice enough to hold them for us. It will be good to finally have these bits of pottery in the cottage, but then I must force myself to forget the folly, and high cost, of shipping these items back across the pond on a second voyage! In spite of the excitement of looking forward to our first summer in Kilkee, I’ve been a bit sad lately because, after making these plans, I recently found out that my daughter will be moving to L.A. at the end of August. The prospect of being away so long, just before Kate would be leaving Chicago, cast a shadow over our plans. However, the good news is that she will be joining us at Rose Cottage for a week at the end of July! I am so happy to have the opportunity to show her the cottage, Kilkee Town and Loop Head, the way I was able to do so with Anton in April, and I am also grateful to have this time with her before she forges ahead with her exciting future! We are hoping to get wireless broadband up and running at the cottage within the first two weeks of our stay. This will be essential for the use of Skype and will also allow me to keep in touch via Blogging from the Bog, with posts and photos. However, it will be no surprised if acquiring broadband in a cottage in the West of Ireland turns out to be an experience worthy of its own blog post! I wish everyone a safe and happy summer! … meanwhile… back to packing! Slán go fóill…. and I’ll See You in September…..